StingRay offers a complete line of heavy duty industrial parts washers with 21 aqueous washing machine models. Designed to last, StingRay Parts washers are engineered for structural Integrity and maximum parts washing effectiveness. StingRay Part Washers conserve water, reduce energy consumption and do not pollute the environment, meeting the goals of green technology solutions. Each StingRay Parts Washer is a pre-designed, configured parts washing solution. With 120 options and features on every industrial parts washer, StingRay tailors to your specific cleaning needs. From aerospace, automotive and railroad, to turbines, steel mills and mining, StingRay has a parts washer for every application. The StingRay 6075 parts washer not only offers an impressive parts washer power density for parts cleaning but also the patented oscillating power wash manifold to maximize parts cleaning in any industrial application. It is the ideal industrial parts washer for off-road and over the road truck engines and transmissions, mining equipment engines, and marine engines. StingRay Industrial Parts Washer offers the world's premier aqueous washing technology. 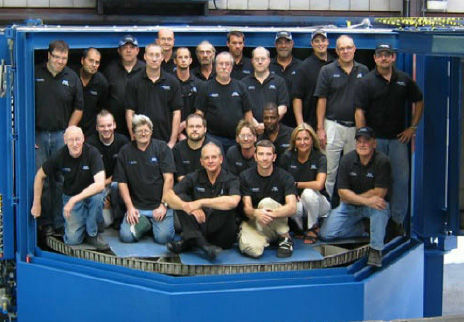 Every StingRay parts washing machine is carefully engineered with proven aqueous cleaning technology and is built in the USA using industrial quality materials and components. Through many years of experience, StingRay parts washers evolved to contain the features of a heavy duty part washers. Each washer is built with the reliability and the appropriate parts washer power density to get the job done in the toughest cleaning applications. StingRay provides a complete cleaning solution by offering various aqueous parts washers, cleaning detergent, spare parts and technical support to fit your parts cleaning needs. StingRay Industrial Parts Washers conserve water, reduce energy consumption and do not pollute the environment. 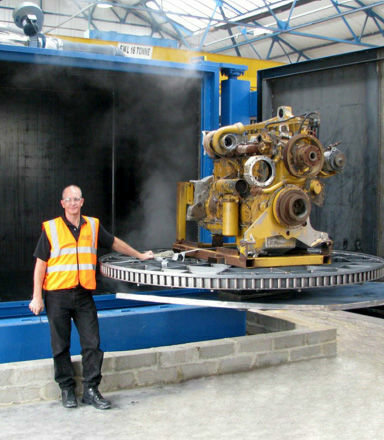 Thus, our environmentally friendly parts washers meet the goals of GREEN TECHNOLOGY cleaning solutions. At the heart of every StingRay Aqueous Parts Washer lies the patented oscillating power blast manifold system that bombards wash loads with hot aqueous wash solution from a different angle each time the parts pass on the rotating turntable providing thousands of cleaning angles. This technology combined with our high-efficiency industrial pump systems, high power density and high output heating systems delivers faster aqueous cleaning cycles and more thorough part cleaning. StingRay cleaning equipment is also environmentally safe with a closed-loop, zero discharge design to meet EPA and OSHA regulations. There are many features of a StingRay Parts Washer including: An automatic aqueous cleaning cycle, enclosed steel aqueous washing cabinet, rotating turntable that retracts when the door is opened, patented oscillating manifold, aqueous solution level management, temperature controlled solution heating, pump suction filter, safety devices, and single point electrical system connection . 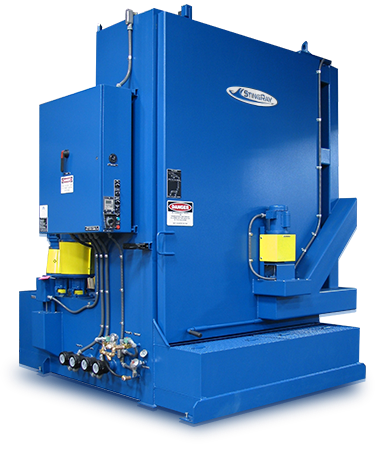 Depending on your parts washing needs, StingRay Parts Washer optional features include: Stainless steel cabinet, heated fresh water rinse system, steam exhaust and blow-off systems. In addition to parts washer features, StingRay also offers a variety of Heavy Duty Parts Washer solution maintenance devices for heavy degreasing applications: Oil skimmer, Sludge scraper, Surface scraper, In-line filtration. The StingRay Oscillating Power Blast Manifold is a superior cleaning mechanism, offering a more efficient cleaning technology than the fixed spray manifold used in many other parts cleaning systems. The patented, non-synchronized oscillating spray manifold blasts every part from a different angle each time the turn table rotates, providing thousands of strike angles during each wash cycle, and in turn, a cleaner part. In addition to the oscillating manifold, The StingRay Power Washer Process cleans using a very low concentration of cleaning chemicals, allowing the solution to last longer before disposal is required. StingRay Power Wash Technology combined with high-efficiency pumping systems and high-output heating systems delivers faster cleaning cycles and more thorough cleaning. Plus, it’s environmentally safe and minimizes rinse cycle requirements, thus saving water and reducing cycle times. Designed to last, StingRay Parts Washers are fully engineered for structural integrity. Built from solid steel rolled rings and rugged steel webbing, StingRay turntable load capacities are some of the highest in the industry. Welding is performed by certified welders to AWS weld specifications using certified welding materials and techniques. All base and door frame structural steel angles meet or exceed the ASTM-A36 requirements. Each component is built for maximum rigidity, strength, and durability.